F-Series spray nozzles produce a flat, fan-shaped spray pattern, with spray angles available from 15° to 110° measured at 40 psi. Spray angles generally increase with pressure. 0° F-Series spray nozzles produce a high impact sold stream. Used in situations where maximum impact is required over a very small target area. STF-Series spray nozzles produce a flat fan-shaped spray pattern, similar to the F Series. 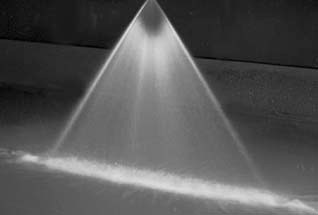 Spray density tapers off toward the outside edges of these sprays, to permit overlapping of spray patterns while maintaining uniform spray density. Spray angles are available for a 0° solid stream to 90°, measured at 40 psi. Spray angles generally increase with pressure. DF-Series thin-disc flat spray nozzles are used where the nozzle must not project beyond the wall of the headder pipe. Minimum recommended pipe size is 1" schedule 80. Optimum thred engagement occurs on pipe 1-1/4" schedule 80 and larger. Usual operating pressures are up to 150 psi.